Increase guest safety, optimize employee management, and improve productivity in a single device. Secure Shift® has been designed using the most innovative technology to maximize staff keycard control. SAFLOK understands that effective employee management can be challenging, especially in large hotels containing many rooms and luxury resorts with sprawling properties. Secure Shift presents a detailed approach to managing employee time, attendance, and access. As a standard feature, Secure Shift is multi-technology enabled. It can read/encode smart, magstripe, and memory cards. Small, lightweight, and durable, Secure Shift leaves a minimal footprint, making it an ideal fit for even the busiest spaces. Its compact design makes it ideal for easy wall mounting. When strategically installed throughout the property, Secure Shift controls access to rooms during specified work shifts. Before beginning their shifts, employees must insert their keycards into Secure Shift to obtain authorization. Employee keycards are inoperable unless authorized by Secure Shift. So not only do managers have a log of employee attendance, but there is also an added layer of security that prevents absent or off-duty employees from potentially misusing their keycard access. A Secure Shift unit can also be used in a parking garage in conjunction with another common area lock. For example, the Secure Shift unit can be placed in the employee section of a parking garage or a gatehouse/guardhouse. Employees could be required to reauthorize their keycard before they even enter the hotel building to begin their shift for the day. 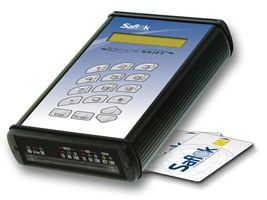 Hotel managers can program Secure Shift to retrieve data and various lock reports using smart and memory cards. For instance, information such as low battery warning on the locks is recorded onto the cards, enabling managers to request reports on all locks with low battery indication. This kind of preventative maintenance immediately increases productivity and saves money. Secure Shift helps ease concerns over lost keys. For example, if an employee’s timed-out key were found, it would not work unless reauthorized to work by a Secure Shift unit. This feature is especially useful in the event of a lost master key, as it requires validation by a Secure Shift station before it can be used. This guards against misuse of the master key outside its intended time frame.